Toggle Modulation ON and OFF - The modulation of the headlight can be toggled on and off by the user at any time. When the bike is started the default is modulation ON. To turn the modulation on or off simply switch your bikes high low beam switch to the opposite position, and then back to the original position within one second (this can be done with the switch in either the high or low beam position). Auto Night Shut-Off - The Diamond Star Headlight Modulator is designed to automatically turn on and off at specific light levels in order to comply with the DOT's regulation of no night time modulation. To Switch From Max to Min Mode - The Diamond Star Headlight Module is equipped with two levels of modulation to meet your visibility requirements. (Both are fully DOT compliant). The default level is "Max" when the bike is turned on, but can easily be toggled to "Min" or back to "Max" by simply pressing the horn button twice within one second. Heads Up Alert - The Diamond Star Headlight Module can be connected to your bikes horn wire in order to add a visual alert to your horn's audible alert. Pressing the horn will cause your headlight to modulate for 3 seconds, then return to steady on; or toggle between min and max mode for 3 seconds if it is already modulating. Please Note: as per D.O.T. regulations, the Heads Up Alert feature DOES NOT work at night! Emergency Headlight Feature - The Diamond Star Headlight Module is constantly monitoring the bulb that you have selected (high beam or low beam). In the event the bulb(s) should fail; the alternate bulb(s) will instantly be turned on. This switching will only be done once; when the bike is turned off and then back on you will not have use of the bulb that failed until it is repaired or replaced. While the Heads-Up Alert feature will continue to function in the event of a headlight failure, the headlight will not modulate otherwise. If you find you cannot get your headlight to modulate, check the bulb. No Excessive Heat Build-Up - Handles high power demand sealed beam and halogen headlights totaling up to 130 watts! Operates efficiently with only slight increase above ambient temperature at continuous max headlight power rating. Surge Protected - Internal protection against transient voltage spikes during engine starts or charging system operation. Also drops out if voltage is too low, avoiding problems associated with low voltage. 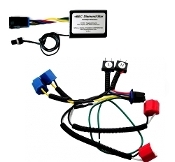 Important Notes: The headlight module is designed for use on motorcycles with a 12 volt DC negative ground electrical systems; and will not work on bikes with an AC electrical system. It can be used with any sealed beam or halogen headlight up to 130 watts for the low beam, and 130 watts for the high beam (260 watts total). The Diamond Star is NOT compatible with HID Lighting. If you have any questions regarding electrical system compatibility with your motorcycle, contact your motorcycle's manufacturer or authorized dealership. The Diamond Star has been designed to provide static free operation with your Radio, CB and Intercom systems; however, some hard-wired systems will still produce unwanted static. If you have any questions regarding your radio, intercom, or CB, you may want to call Signal Dynamics technical support at 800-785-1814 before installing the unit on your motorcycle. The Diamond Star is legal to use on motorcycles in all 50 states, and Canada.